This is the fifth unit in my new Kindergarten Writing Series! All materials are Common Core aligned and are easy to implement and use in differentiated settings. I will be taking you from the the first few weeks in kindergarten all the way through the end of the year. These units are also perfect for first grade and second grade writing instruction as well. This listing is for the OPINION UNIT only. This will help take the guess work out of, "How do I teach my students to write?!" The units will be sequential and progressively get harder throughout the school year as students' skills develop. Unit 5 is so much fun to teach! "I like ______ more than ______ because..."
This unit will teach your students how to write about their opinions and give supporting details. Activities provide scaffolding so your students can be confident and successful writers! Included are activities suitable for whole group instruction, small groups, writing stations and independent work. ★ Which do you prefer? 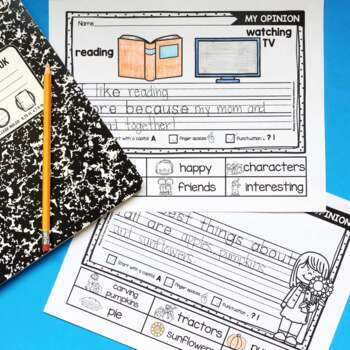 Activities to introduce students to writing about their opinions. 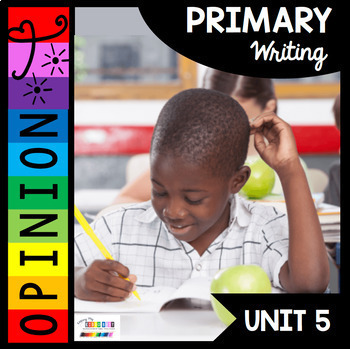 Each activity gets slightly more difficult as students become more comfortable with writing their opinion. ★Which one do you like more? Students choose between foods and/or activities to decide which one they like more. They then support their opinion with words from the word bank. "I like my _______ more because____________________." Students enjoy the routine and predictability of these activities and their confidence grows each time they complete a writing prompt. Students choose a box/word to write about their opinion. A graphic organizer and writing paper are included so students can provide reasons/details to support their opinion. Six holidays and four season are included! 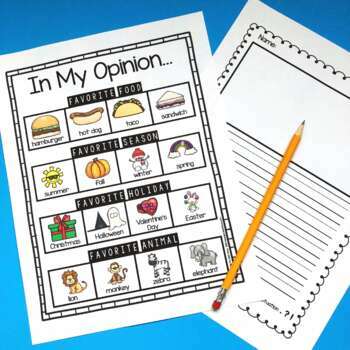 Students can practice writing their opinion throughout the entire year. "The best things about __________ are...."
Halloween, Thanksgiving, Christmas, Valentine's Day, St. Patrick's Day, Easter, Summer, Fall, Winter and Spring. I use this activity towards the end of the unit once students feel more confident about writing their opinion and giving supporting details. Students choose an item they think is best and then give reasons why they think so. Supporting vocabulary is given for each picture to assist students with writing details. PLEASE SEE PRODUCT PREVIEW FOR PHOTOS, DETAILS AND IDEAS. FOLLOW ME FOR SALES, NEW PRODUCTS, PICTURES and MORE!